The Cow Creek Band of Umpqua Tribe of Indian's (the "Tribe") Creekside Development Project is a comprehensive 250 acre project whose physical components will augment and support the Tribe's Seven Feathers Hotel & Casino Resort, the Truck & Travel Center, and the Tribe's motels; as well as providing support services to the surrounding community including the City of Canyonville. Drinkable and Grey Water Systems. Sewage Management for Tribal businesses. Restoration of Jordan Creek, which approximately bisects the project lands. The purpose of the Jordan/Alder Watershed Assessment document (11 Mb PDF download) is to identify habitat restoration opportunities in the Jordan/Alder Watershed. 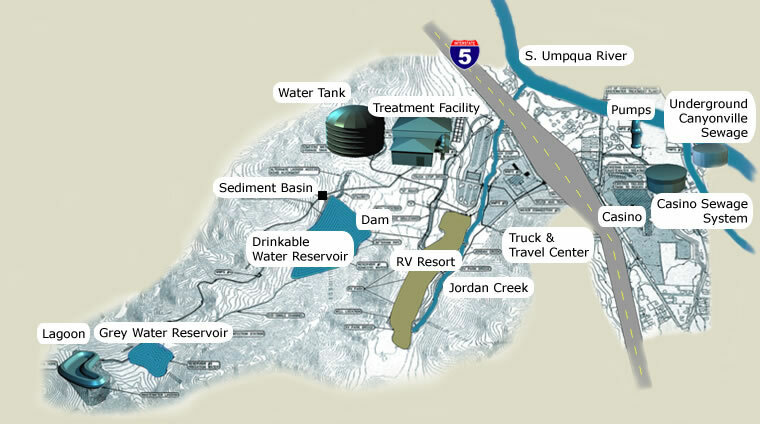 Improvements to the South Umpqua River environment. The new Seven Feathers RV Resort. Umpqua Indian Utility Cooperative providing electricity for project components. Seven Feathers Hotel & Casino Resort. Seven Feathers Truck & Travel Center. The City of Canyonville (in emergencies). Drinkable Water Dam, the Creekside Reservoir. Seven Feathers Hotel & Casino Resort's septic system. Seven Feathers Truck & Travel septic system. Seven Feathers RV Resort's septic system. City of Canyonville's grey water. Dam and Grey Water Reservoir. Feeder lines from septic system grey water outputs. Output lines to irrigation systems. For more information about the water subsystems see the subsections titled Clean Water and Grey Water.